RMC Wah pedals are often backordered. If you're buying a pedal that is backordered please don't use paypal because they'll charge you at the placement of the order. Use a credit card which won't be charged until we are processing your order for shipping. If you are overseas (cannot use a credit card), or you want to use paypal, then paypal will be ok. Make sure you QUIT out of the paypal payment screen to abort payment. Then I will contact you when the pedals come in and you can complete payment. Analog Man Guitar Effects Pedals sells the new RMC6FL Wheels of Fire wah by Geoffrey Teese. There are now external adjustments on the front. This was a rumor for a long time, now it's available to anyone. You like the sound of Clapton in Cream? WHO DOESN'T!!! What began as a custom piece in 2003 has finally become an official part of the RMC lineup in 2006. The WHEELS OF FIRE wah features the sound of the original Macari built wahs of the 1960's and 1970's England. 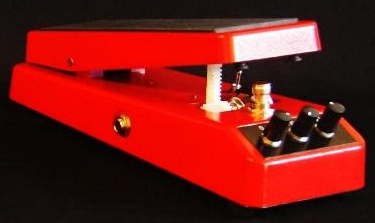 While housed in an extended red hammertone wah case, the WOF duplicates the extra-wide sweep range and all the other nuances of the Macari original. WOF special features include front mounted controls for volume, Q, and low end emphasis. The RMC6FL is developed and built by Geoffrey Teese and includes licensed fuzz-friendly technology, EMI resistant Karmaflux inductor, heavy-duty Italian true-bypass on/off switch,exclusive RMC ROC-POT5 extra long-life sealed potentiometer,Switchcraft jacks, easily adjustable rocker tension, and AC adapter jack, and is covered by our limited one year warranty. The RMC6FL also features the under-the-rocker toggle switch to change sweep speed and low end resonance. The RMC6FL is housed in our new extended wah shell with a silk-screened bottom plate, classic red hammertone finish, and topped with a black footpad. The wah sounds of merry old England have returned to the market at last.